The Counterproliferation Papers Series was established by the USAF Counterproliferation Center to provide information and analysis to assist the understanding of the U.S. national security policy-makers and USAF officers to help them better prepare to counter the threat from weapons of mass destruction. Copies of No. 54 and previous papers in this series are available from the USAF Counterproliferation Center, 325 Chennault Circle, Maxwell AFB AL 36112-6427. The fax number is (334) 953-7530, phone (334) 953-7538. The views expressed in this academic research paper are those of the author and do not reflect the official policy or position of the U.S. government or the Department of Defense. In accordance with Air Force Instruction 51-303, it is not copyrighted, but is the property of the United States government. I would like to express my gratitude to the Blue Horizons Study Program, USAF Center for Strategy and Technology which made possible the research and writing of this study. Most importantly, I would like to give my sincere appreciation to Col (ret) Ted C. Hailes, my advisor, for his valuable comments, insights, and direction on my research; and Col (ret) Dr. John P. Geis, Director USAF Center for Strategy and Technology for his guidance and advice as I researched and prepared this study. Finally, a special thank you to Dr Barry R. Schneider, Director USAF Counterproliferation Center (CPC) for his editorial comments and insights, as well as, Mrs. Bonita Harris and MSgt Wesley Powell of the CPC staff for their help regarding formatting, editing, and publishing support. Environmental, Safety, and Occupational Health Manager. Furthermore, Lt Col Almosara has led multiple emergency response operations both overseas and stateside. He holds a masters degree in Public Administration from Northern Michigan University and Military Operational Art and Science from Air Staff and Command College. The developmental trends in biological sciences indicate there is a plethora of possibilities concerning the study of microorganisms and its applicability in creating the next biological warfare agent. Both historical and recent events show the potentially devastating effect of using biological warfare agents and the terror they cause among the populace. Even more alarming is that technological advancements in the field of biological sciences will transform biological warfare agents into a new classification of genetically engineered pathogens eliciting catastrophic consequences.2 Nations, groups, and individuals that have the resources, capabilities, and knowledge to develop this technology in the year 2035 will have the global arms race advantage. Just as the twentieth century was the “century of chemistry and physics,” the twenty-first century will emerge as the “century of biology.”  It will forever change how living organisms will be viewed because of the biotechnological revolution in altering and replacing genetic materials. Biotechnology has already transformed scientific applications in the fields of medicine, agricultural, and other biological industrial areas. The term is defined as the “fusion of biology and technology…it involves the use of industry recombinant DNA (deoxyribonucleic acid), cell fusion, and new bioprocessing techniques,” such as human genome sequencing. Human genome sequencing was first considered in the mid 80s. In 1988, the Department of Energy and the National Institute of Health funded a Human Genome Project (HGP), a 15-year project with a target completion date of 2005. With the rapid technological advancement and international participation, the project was completed in 2003.5 Since then the number of human gene manipulations and new findings of significance to the advancement of medicine have soared. Biotechnological-related patents have also increased tenfold in 24 years and continue growing at an exponential rate. The “bright side” of advancements in biotechnology is offering great promise in improving human health, combating diseases, and promoting a better quality of life. But, for every “bright side” there is an opposing “dark side.” Biotechnology, when used maliciously or negligently, can destroy human life. Advanced biotechnology, in particular genetically engineered pathogens such as viruses, and bacteria, could become a potential choice for use as biological warfare agents. Imagine, a suicide bomber going through the airport security system. With sensors employed in terminals, chances are this suicide bomber has a good chance of being detected and detained. Now, imagine the same individual going through the airport security system but instead of having a bomb he was injected with a genetically engineered virus capable of transmitting a highly virulent disease that could be triggered at a time chosen by the perpetrator. The chances of this person getting through without being detected would arguably be very high. By the time he would have started showing signs and symptoms of an illness, he would already have infected people around him. The snowball effect of infection would become an imminent public health disaster. This scenario is notional but is disconcerting to say the least. Knowledge that there is no inspection process or detection equipment in our airports to detect this type of threat can easily encourage radical groups or individuals to employ such a deadly weapon. It is imperative to develop capabilities to deter such attacks before they strike the homeland using these heinous weapons. Will advancements in biotechnology enable genetically engineered pathogens to become a weapon of choice for nations, groups, and/or individuals in 2035? In presenting the argument, a look into conventional biological warfare agents is necessary before focusing on advanced systems in determining the plausible role and effects of genetically engineered pathogens in the future. Characteristics of each pathogen will be discussed to determine the threats and challenges they may present by the year 2035. Rogue states, radical groups, and individuals, given the opportunity to employ biological weapons, will most likely use it to inflict harm and terror on the United States and its allies. Therefore, knowing what is to come will allow the United States to prepare for and deter the use of these nefarious weapons. To comprehend the nature of Biological Warfare (BW) it is important to be familiar with the basic concepts and capabilities that underscore this threat. BW is the premeditated employment of harmful microorganisms to attack a target population that can either cause incapacitation or death. The microorganisms that serve as BW agents are bacteria, viruses, and toxins, and are naturally-occurring pathogens. The physical characteristics and properties of these pathogens inherently make them viable offensive biological weapons. Bacteria are microscopic single-celled organisms with varying sizes and shapes ranging from spherical cells (cocci) to rod-shaped organisms (bacilli). This single-celled living organism contains the genetic material DNA, cytoplasm, and a cell membrane. Though most bacteria are harmless, some are pathogens that can cause disease in humans and animals by means of invading the host tissue or by producing poisons (toxins). 10 Some bacteria can rapidly increase in numbers and under the right conditions are able to multiply more than a million fold in less than four hours. The human body is the ideal environment for bacteria to regenerate. Bacillus anthracis (anthrax), Yersinia pestis (plague), Francisella tularensis (tularemia), Brucella sp. (brucellosis), and Coxiella burnetti (Q fever), are all bacterial agents that reproduce quickly in the human body. Viruses are parasitic in nature; they can only survive and multiply if they are fused with the cells of a live host. The hosts can be humans, animals, plants, or bacteria. Viruses are the simplest microorganisms; they are much smaller than bacteria and consist of a protein coat containing the genetic material in the form of RNA (ribonucleic acid) or DNA. Each virus requires its own unique type of host cell for multiplication and once the interaction between the cell and virus occurs, it can infect all other cells. Conventional viral agents that have the ability to shut down the human body include smallpox, influenza, yellow fever, encephalitis (various), dengue fever, chikungunga, Rift Valley fever, and hemorrhagic fevers (Ebola, Marburg, Lassa). Yet another group in the potentially dangerous pathogen arsenal is toxins. Toxins are harmful substances produced by animals, plants and microbes. Though they are non-infectious because they cannot be transferred through secretions or skin contact, toxins can debilitate the human body and possibly lead to death.14 Some naturally occurring toxins include the following: botulinum toxin, staphylococcus enterotoxin, ricin toxin, clostridium perfringes, mycotoxins, aflatoxin, and shigella toxin. These biological agents have been used in warfare almost from the beginning of time. Historical events reveal many examples of biological weapons usage. In 300 BC, the Greeks, Romans and Persians contaminated their enemies’ water supply with dead animal carcasses. In 400 BC, the Scythian archers infected their arrows by dipping them in decomposed bodies. In the 14th century AD, the Tartar forces catapulted plague-infected corpses in the siege of Kaffa. Again in 1710, the Russians employed the same tactics of catapulting plague-infected cadavers against Swedish forces. During the French-Indian War in the 18th century AD, British forces provided blankets contaminated with smallpox to the Native Americans. Finally, in 1939-42, the Japanese used massive BW agent attacks in China including bombing them with masses of fleas carrying the bubonic plague. 10 km2. For a 12.5-kt nuclear weapon there would be a circular area of destruction of 7.8 km2 in which 23,000 to 80,000 people could be killed. In the second scenario, 100 kg of anthrax spores were released by an aircraft along a line to the windward side of Washington, DC. On a clear sunny day with a light breeze, 46 km2 would be affected and 130-460,000 people could die. On an overcast day or night with a moderate wind, 140 km2 would be affected and 420000 to 1,400,000 people could die. On a clear, calm night an area of 300 km2 would be affected and between 1 and 3 million people could die. Though the results above were only estimates of probable effects, it can be assumed that these conventional biological weapons can produce massive amounts of destruction. But, with the advancement of biotechnology, the worst devastation may be yet to come using the new generation of biological warfare agents known as genetically engineered pathogens. Biotechnology promises great benefits for humanity but if used malevolently could cause mass destruction. The National Intelligence Council stated in its study, Mapping the Global Future: 2020, that, “Major advances in the biological sciences…probably will accelerate the pace of BW agent development, increasing the potential for agents that are more difficult to detect or to defend against. Through 2020 some countries will continue to try to develop chemical agents designed to circumvent the chemical weapons regime.”22 Advances in biotechnology have paved the way allowing the modification of naturally occurring pathogens into a new generation of genetically engineered pathogens. These new pathogens could then be potentially developed into extremely deadly biological agents that could be untreatable and uncontrollable making them more dangerous than conventional biological weapons. In 1997, a study was conducted to identify future threats and uses of advanced biological warfare agents. The JASON group, composed of academic scientists, served as technical advisers to the U. S. government. Their study generated six broad classes of genetically engineered pathogens that could pose serious threats to society. These include but are not limited to binary biological weapons, designer genes, gene therapy as a weapon, stealth viruses, host-swapping diseases, and designer diseases. Some of these genetically engineered pathogens, according to historical records, have already been produced and stockpiled. Each of the six classes will be analyzed in the light of its history and likelihood of its possible future use. Binary biological weapons: This bioweapon is made up of a two-component system with independent elements that are safe to handle separately but when mixed together form a lethal combination. This system consists of a virus and helper virus, or bacterial virulence plasmid. Hepatitis D is an example of a virus and B as the helper virus; a combination of both produces severe infection to the host. “Hepatitis D needs to infect cells simultaneously with the unrelated virus hepatitis B; both are primarily transmitted through sexual contact or by contaminated blood or needles. The D virus takes advantage of the proteins expressed by the larger B virus, and greatly increases the severity of disease caused by hepatitis B. Infection by hepatitis D alone is not possible.” Examples of bacterial virulence plasmids are the plague (Yersinia pestis), anthrax (Bacillus anthracis), dysentery (Shigella dysenteria), and E. coli (Escherichia coli). Union defector. In 1992, a defector from the former Soviet Union code-named “Temple Fortune,” described his experience with binary biological weapons. He revealed that the former Soviet Union secretly continued research on a “new and improved super-plague” (Yersinia pestis) despite President Yeltsin’s order to end their offensive biological warfare program. The defector explained that the super-plague “would not only be more resistant to multiple antibiotics but it would be made with a special new process…In its initial form, the plague would not be virulent – so it would be safe to handle and store…Russian Scientists had found a way to convert this non-toxic plague back into a deadly, antibiotic-resistant form as soon as it was needed for weaponization.” Because of its properties and ability to be stored in large volumes for a long period without causing any harm, it is presumed that Russia still maintains this bioweapon. It could also be argued that nations who have the equipment, material, resources, and knowledge could very easily produce these genetically engineered pathogens. Binary biological weapons are good candidates for future use because of their benign properties making them easy to store and handle. Because the components are not independently dangerous or hazardous they can easily be transported requiring less signatures for manufacturers. This also makes tracking more difficult. Future Application: The binary biological weapons processes are already known and are here to stay. In the wrong hands, bioweapons are an impending and dangerous threat. Designer Genes and Life Forms: The successful completion of the human genome project paved the way to understanding the nature and content of the complex genetic information that could be used to create new biological life forms. There are about 599 viruses, 205 naturally occurring plasmids, 31 bacteria, 1 fungus, 2 animals, and 1 plant genomic sequence known to date. This wealth of information regarding human genomes could expand the life forms using synthetic genes, synthetic viruses, and synthetic organisms. The designer genes have been one of the greatest breakthroughs in the field of biotechnology. Using the technique called recombinant DNA technology (gene splicing), a single gene is inserted in an organism to alter its genetic properties. An example is the splicing of genes to produce insulin for diabetics. Genes responsible for generating insulin are spliced into plasmid DNA that can then infect bacteria. The infected bacteria will then multiply and the product is a large amount of insulin for medicinal purposes. Despite the benefits of this biotechnology, the perils cannot be overlooked because genes can be programmed into an infectious state that could easily be transformed into a bioweapon. As biotechnology advances and techniques are refined, scientists are exploring the complex genetic information to improve human life and perhaps create a new form of organisms. Another technique for gene therapy is the DNA shuffling. DNA shuffling—also known as multigene shuffling, gene shuffling, and directed in vitro molecular evolution—has allowed scientists to greatly improve the efficiency with which a wide diversity of genetic sequences can be derived. A quantum leap in the ability to generate new DNA sequences…can be used to produce large libraries of DNA that can then be subjected to screening or selection for a range of desired traits, such as improved protein function and /or greater protein production. Using this method there was an observable increase in antibiotics production generated from bacteria. This biotechnology undoubtedly offers great opportunities for medical purposes, but it could also have a significant impact in the production of genetically engineered pathogens resistant to drugs or vaccines, and increase virulence well-suited for bioweapons. State of the Bioweapon: Designer genes could become the most lethal form of bioweapon of the future. Nations that are interested in developing lethal weapons can openly use the genomic sequence databases to choose the genes they want to design. One assessment noted, “The ever-expanding microbial genome databases now provide a parts list of all potential genes involved in pathogenicity and virulence, adhesion and colonization of host cells, immuneresponse evasion and antibiotic resistance, from which to pick and choose the most lethal combinations.” With this wealth of information it would be possible to create diseases using synthetic viruses that could wipe out an entire population. Imagine using synthetic viruses to recreate the Spanish Flu pandemic of 1918 that killed 20 million people; the worst ever in history. The scientific and technological breakthroughs in genetically engineered pathogens have already changed the future outlook of the biological weapons and its threat. In October 2004, the Spanish Flu strain of 1918 was partially reconstructed by researchers at the University of Wisconsin using reverse engineering techniques. The influenza A virus was fully sequenced and characterized the following year. Experts predicted that, “Although, the knowledge, facilities, and ingenuity to carry this sort of experiment are beyond the abilities of most non-experts at this time, this situation is likely to change over the next 5 to 10 years”. Though this experiment was conducted with the intent to prevent re-emergence of the devastating influenza pandemic, in the wrong hands it would offer potential offensive bioweapons capabilities. Future Application: This is the bioweapon to watch for in the next 25 years. This technology is highly complex and only nations or groups that have biotechnological capabilities will be able to develop these genetically engineered pathogens. Advancements will continue to increase as the scientific world keeps finding new and innovative ways to manipulate human genetics. State of the Bioweapon: Gene therapy has already been used in both animal research and human clinical trials. Numerous examples of successful gene therapy application have been published and shown to have promising results; University of Michigan and Kansai Medical University, Japan, reported that “they had used gene therapy to restore hearing in mature deaf animals.” According to the study, “gene therapy can be used to regenerate functional hair cells, which are necessary to restore hearing, by using an adenovector to deliver the ‘healthy’ gene into nonsensory cells that reside in the deaf cochlea…upon delivery, hearing is substantially improved.” Another example of this technology was replacing a mutant gene that prevents production of an enzyme called “adenosine deaminase (ADA).” Blood was extracted, treated and reinjected into the person’s system. According to the report, this therapy was relatively successful; unfortunately other cases using gene therapy were not as successful. Though the progress of gene therapy is significant, there are more questions to answer and techniques to refine before this therapy becomes a viable treatment for many types of diseases. Another significant gene therapy outcome was the mousepox virus experiment in Australia. Researchers inadvertently developed a lethal mousepox virus while attempting to prevent the plague, within the mice population. This genetically altered virus attacked the immune systems of the experimental mice; it killed all of them. Researchers also found that sixty percent of those mice previously vaccinated died within days of exposure.42 Although this was unintentionally created, if the same modified virus was added to smallpox, it could present the same lethality for humans. Future Application: Gene therapy is expected to gain in popularity. It will continue to be improved upon and could unquestionably be chosen as a bioweapon. The rapid growth in biotechnology could trigger more opportunities to find new ways to fight diseases or create new ones. Nations who are equipped to handle biotechnology are likely to consider gene therapy a viable bioweapon. Groups or individuals without the resources or funding will find it difficult to produce this bioweapon. Stealth Viruses: The basic concept of this potential bioweapon is to “produce a tightly regulated, cryptic viral infection that can enter and spread in human cells using vectors” (similar to the gene therapy) and then stay dormant for a period of time until triggered by an internal or external signal. The signal then could stimulate the virus to cause severe damage to the system. Stealth viruses could also be tailored to secretly infect a targeted population for an extended period using the threat of activation to blackmail the target. State of the Bioweapon: Stealth viruses just like the gene therapy, require a vector to be inserted in the body and lay dormant until a trigger mechanism is activated either internally or externally. Imagine having a cancer causing virus enter a human cell and lay dormant until an external signal triggers the disease. When the signal gets activated the cells become abnormal and could rapidly generate abnormal cell growth leading to a tumor and ultimately, death. Now, apply this concept to a population where an HIV virus gets disseminated within a target population. At a specific time chosen by the perpetrator, the signal would be triggered to harm an entire population all at once. Although this bioweapon is futuristic it is not improbable and deserves to be examined. Future Application: Stealth viruses could become a potential bioweapon in the year 2035. There is much more to learn about the timing of the triggering mechanism to make this a feasible bioweapon. However, with the rapid rise in biotechnology, nations who have the capabilities to conduct research and development could certainly attain that level of knowledge. It would be highly unlikely to see groups or individuals possessing this bioweapon. Host Swapping Diseases: Most viruses do not cause disease and are mainly considered parasites. They exist in evolutionary “equilibrium” with their host ranges, but if the “equilibrium” is disrupted, two things could happen; either the viruses become virulent or benign. Disruption of “equilibrium” occurs when a virus jumps out of its host range and transfers to a different host species where it could create another virus by mutating or picking up other genes by mistake. Animal viruses usually reside naturally in a “reservoir” or certain animal species and cause little to no damage to its host. Eastern equine encephalitis uses water fowl for its reservoir, rodents carry hantavirus, bats are the hosts for Ebola virus, and chimpanzees for the AIDS virus. When these viruses move out of their natural host reservoirs they eventually produce extremely lethal pathogens. Category A, meaning high-priority agent. Future Application: It could be argued that host swapping diseases as a bioweapon are already in existence. Nations, groups, and individuals could have fairly easy access to this bioweapon. With the rapid increase in biotechnology and with its dual-use nature, these genetically engineered pathogens can be extremely debilitating to a populace. Designer Diseases: The knowledge of cellular and molecular biology has progressed nearly to a point where it may be possible to conceptually design a disease first and then create the pathogen to produce the desired effect of that disease. These designer diseases might work by attacking the immune system to affect the cells’ natural ability to fight diseases (i.e., HIV virus causes AIDS), or it might reactivate dormant genes to cause destruction of cells (spread of cancer), or simply instruct cells to commit suicide and die (programmed cell death or “apoptosis”). Apoptosis can be useful in curing diseases like cancer. But, it can also be used to activate “death pathways” that could kill all cells at once. State of the Bioweapon: The designer diseases are certainly a futuristic bioweapon but by no means inconceivable. Imagine designing a disease that could wipe out the whole population or a certain ethnic group? These bioweapons demand more investigation and research to fully understand their nature, properties, and potential harm. Future Applications: Designer diseases could be a viable candidate as a potential bioweapon in 2035. These bioweapons deserve to be further evaluated for future research. Nations who have the resources and capabilities to conduct research and development could certainly attain the knowledge to make this bioweapon a reality. It would be highly unlikely to see groups or individuals possessing this bioweapon. DNA extractions with a complete materials list and recipes are widely available on the internet. Additionally, a “terrorist cookbook” as shown in Figure 2, contains recipes for making explosives using household chemicals. These are just a minute sample of the valuable information and examples of how easily materials and equipment can be accessed through the internet. 51 University of Arizona, “General Biology Lesson Plans,” http://biology.arizona.edu/sciconn/lessons2/Vuturo/vuturo/mat_list.htm. (accessed 21 Jan 2010). 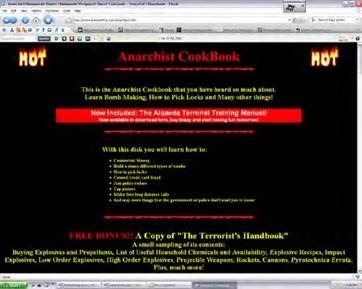 52 Anarchist Cookbook, http://www.licensed4fun.com/anarchist1.htm, (accessed 21 Jan 2010). 53 National Intelligence Council, Global Trends 2025: A Transformed World, NIC 2008-003, Nov 2008, 70. http://www.dni.gov/nic/PDF_2025/2025_Global_Trends_Final_Report.pdf. (accessed 10 Dec 2009). differentiate its legitimacy for conducting biotechnology research vis-à-vis research for offensive military biological weapons. Additionally, the Biological and Toxin Weapons Convention lacks effective verification provisions to check the parties’ compliance with the program—as exemplified by the former Soviet Union who carried out a massive illegal offensive biological warfare program. Biological warfare agents are mostly invisible to the human eye and naturally present in the environment. One of the advantages of using biological warfare could be “an optimal death to cost ratio; they are virtually undetectable; and they offer the potential for mass panic.” This is a positive motivation for nations, groups, and individuals to pursue genetically engineered pathogens as a weapon of choice. Biological warfare attacks may resemble a natural disease outbreak phenomenon and it would be very difficult to trace back to the source, thereby discounting the perpetrator’s actions. “Historically, attributing blame for biological warfare use has been fraught with controversy and may take a very long time. Only in 2002, for example, did a court in Japan formally acknowledge the Imperial Japanese Army’s deliberate infection of Chinese prisoners with bubonic plague in 1940-42.” Finally, the 1918 Spanish flu epidemic killed at least 20 million people worldwide. Though, in this case it was a natural pandemic, what if a nation, group or individual could develop genetically engineered pathogens that could yield the same or higher catastrophic loss of life on their enemy? “That, in essence, is the potential effect of applying genetic engineering for biological warfare” and a compelling reason to choose genetically engineered pathogens as a weapon of choice. I’m out on the border, I’m walkin’ the line…Don’t you tell me ‘bout your law and order…I’m try’n’ to change this water to wine. Genetically engineered pathogens are here to stay and could be used as potential bioweapons. The fact is that there is always a consequence for every action taken and although biological weapons seem, on the surface, to be an easy answer, the repercussions can even be devastating to the user. This is why it has not been more universally applied. This chapter will address the treaties as well as the moral and ethical issues that cause drag and friction in using genetically engineered pathogens as bioweapons. (1) Microbial or other biological agents or toxins, whatever their origin or method of production, of types and in quantities that have no justification for prophylactic, protective, or other peaceful purpose. (2) Weapons, equipment, or means of delivery designed to use such agents or toxins for hostile purposes or in armed conflict. The difficulties and challenges raised by this treaty are compliance issues. The Arms Control Association reports, “The convention has been flagrantly violated in the past…the U.S.
government listed, in addition to Russia, BWC states-parties China, Iran, and North Korea, as well as BWC signatory Syria, as possessing offensive biological weapons in violation of the treaty.” Additionally, the absence of an effective verification provision to ensure the statesparties are abiding with the treaty has raised “real concern over proliferation because of the dualuse nature of the technology, a crucial element in the web of policies required to prevent proliferation of biological weapons capabilities has been left extremely weak.”63 To compound the problem even more, in 2001 the US rejected the draft protocol that would require states to submit declarations of treaty-relevant facilities and activities to an international body. This caused friction between the states-parties and discussions concerning verification measures remain unclear. Rogue nations who become involved with dual-use technology could produce offensive biological warfare agents with little risk of being tracked. They could also easily be engaged in clandestine proliferation of genetically engineered pathogens as a bioweapon. biotechnological industries has also triggered the rise in concern for ethical standards. In 1995, President Clinton formed the National Bioethics Advisory Commission to address ethical issues of biotechnology. President Bush, followed suit, but introduced a more conservative approach. Government intervention and peoples’ ethical values will undeniably slow down biotechnology research and development programs. [its] command against such warfare…” The appeal resonated among the international community that States adopt the 1925 Geneva Protocol, banning use of poison gas and bacteriological weapons. Bioethical concerns for nations who believe in the rights and values of their citizens will always have friction when proceeding to adopt a complex biotechnology that touches life itself. The danger is that those nations that are not constrained by such ethical considerations have an open playing field within which to work. If they can create weapons in areas that most other nations are not even allowed to look at, it will give them a potential asymmetric advantage. The “genie” is already out of the bottle. The fast pace of biotechnology has led to new findings in the world of genetic engineering. The Human Genome Project has opened more avenues among industrial countries and the scientific world to explore the phenomenon of living organisms. These stunning discoveries have led to research into the characteristics and causes of diseases through a consortium of international scientists whose goal is to discover the more complex attributes of human genomes. The knowledge and the capability to generate new forms of organisms are here to stay and man’s imagination is the only limit. Biotechnology, with its dual-use nature, could be among the most inspiring life-giving discoveries of the 21st century, but it could also become the world’s most lethal weapon if used malevolently. The threat of genetically engineered pathogens will dominate the future of biological warfare. It has been historically documented that conventional biological weapons have been used overtly and covertly. Hence, rogue nations, groups, and individual actors, given the opportunity to use these highly lethal bioweapons, will likely mount an attack to fight off the great powers or to dominate regional adversaries. Their threatened use can also be helpful in deterring attacks by rivals. Conventional biological weapons, as deadly as they are, might be insignificant compared with the lethal effects of genetically engineered pathogens as biological warfare agents. The table below summarizes the six classes of genetically engineered pathogens and whether nations, groups, or individuals could potentially use these bioweapons. The six classes of genetically engineered pathogens discussed in this paper are binary biological weapons, designer genes, gene therapy as a weapon, stealth viruses, host swapping diseases, and designer diseases. All six bioweapon categories could potentially be used or produced by nations. However, only three of these categories could arguably be used by groups and two by individual actors. Several reasons why genetically engineered pathogens could become a weapon of choice for nations, groups, and individuals are as follows: 1) genetically engineered pathogens are relatively cheaper to develop than nuclear weapons, 2) science and technology are becoming more sophisticated and transparent, 3) as the world becomes flatter, accessibility to materials and information are within reach, 4) use of advanced bioweapons could have desired long lasting effects, 5) means of disseminating genetically engineered pathogens could be as simple as an infectious person coming in contact with external trigger points, 6) the dual-use nature of biotechnology means absence of agent signatures and less red tape for regulatory tracking purposes, and 7) the identity of attackers can be concealed as biological weapons can be used that do not result in immediate or discernable effects, allowing a clandestine attack and a withdrawal before the disease manifests itself. For individual actors who are motivated to spread their radical ideologies and would execute whatever is necessary to achieve their goals, the use of these advanced bioweapons could potentially deliver their message, sometimes without penalty if the identity of the attacker is concealed. Individual actors could easily pursue binary biological weapons and the hostswapping disease bioweapons as their weapon of choice because these bioweapons are already in existence and will only become even more readily available by the year 2035. The “genie” will never again be constrained by the bottle. No matter how small the chance that genetically engineered bioweapons can get into the wrong hands, the United States must stand prepared because the scale of devastation could be massive. America must, at all costs, provide deterrent measures to protect the greatest asset of this nation, the freedom of the American people. This paper examined the rapid advancement of biotechnology in particular genetically engineered pathogens in becoming a weapon of choice for nations, groups, and/or individual actors by the year 2035. Nations are more likely than groups or individuals to have these genetically engineered pathogens as weapons of choice. The modern revolution in biotechnology has given conventional biological warfare agents a new meaning. With the wealth of information regarding human genomes, it is all the more critical to understand the next generation of biological weapons, in particular, genetically engineered pathogens. The complex and technical intricacies of these advanced biological weapons demand that the user be highly trained; this limits their use by individuals and financially unsupported groups. The properties and characteristics of these genetically engineered pathogens could make them appear quite benign, but when triggered by a signal, they could become extremely lethal. Thus, the nature of these bioweapons could make a covert attack appear to be a natural disease outbreak; and by the time of discovery, the damage would already have been done. As noted, Japan, after more than half a century, only then formally acknowledged that they used biological weapons in mainland China. Biotechnology and its dual-use nature will continue to revolutionize the biological weapons program. When a weapon system can have a small footprint, become easy to manipulate, and be used at a specific time and place of the attacker’s choosing, then it will almost invariably become a highly sought after weapon for mass destruction. Biological warfare may be is inevitable by the year 2035. It can never be too early to be prepared with the knowledge and power to deter or prevent such an attack. The United States cannot afford to lose this battle. Ainscough, Michael J. Next Generation Bioweapons: Genetic Engineering and Biological warfare. in The Gathering Biological Warfare Storm, eds. Jim A. Davis and Barry R. Schneider. Westport, CT: Praeger Publishers, 2004. 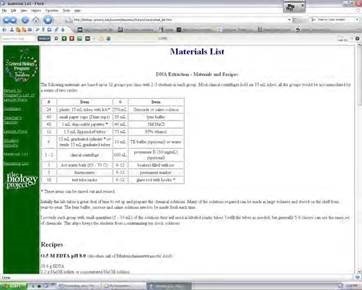 Anarchist Cookbook, http://www.licensed4fun.com/anarchist1.htm, (accessed 21 Jan 2010). Arms Control Association. The Biological Weapons Convention at a Glance. 2006, http://www.armscontrol.org/print/2472, (accessed 13 Dec 2009). Biotechnology. http://www.medterms.com/script/main/art.asp?articlekey=2467, (accessed 16 Nov 2009). Block, Steven M. Living Nightmares: Biological Threats Enabled by Molecular Biology. in New Terror: Facing The Threat of Biological and Chemical Weapons. Eds. Sidney D. Drell, Abraham D. Sofaer, and George D. Wilson. Hoover Institution Press: Stanford University Stanford, CA, 1999. British Medical Association. Biotechnology Weapons and Humanity. United Kingdom: Harwood Academic Publishers, 1999. Bush, George W. The National Security Strategy of the United States of America, September 2002. ——-. Homeland Security Presidential Directive-10: Biodefense for the 21st Century. http://www.fas.org/irp/offdocs/nspd/hspd-10.html, (accessed 5 December 2009). CDC. http://emergency.cdc.gov/agent/agentlist-category.asp, (accessed 24 November 2009). Cohen, William Interview. May 1998. In Tom Mangold and Jeff Goldberg, Plague Wars: The Terrifying Reality of Biological Warfare. New York: St. Martin’s Press, 1999. Collins, Francis S. and others, eds. The Human Genome Project: Lessons from Large-Scale Biology. Science Magazine, Vol 300, 2003. http://www.sciencemag.org (accessed Nov 16, 2009). Clunan, Anne L. Introduction: Identifying Biological Agents, Characterizing Events, and Attributing Blame. In Terrorism, War or Disease. eds. Anne L. Clunan, Peter R. Lavoy, and Susan B. Martin. Stanford, CA: Stanford University Press, 2008. Dando, Malcolm. Bioterror and Biowarfare. Oxford: Oneworld, 2006. ———. Biological Warfare in the 21st Century. London, UK: Brassey’s, 1994. Enemark, Christian. Biological Weapons: An Overview of Threats and Responses. Canberra: The Australian National University, 2003. Fraser, C.M. and D.R. Dando. 2001. Genomics and future biological weapons: The need for preventive action by the biomedical community. Nature Genetics 29(3):253-256. In Institute of Medicine and National Research Council. Globalization, Biosecurity, and the Future of the Life Sciences. Washington, DC: the National Academies Press, 2006. Garreau, Joel. Radical Evolution. New York: Broadway Books, 2005.
International Human Genome Consortium. Initial sequencing and analysis of the Human Genome. Nature, Vol 409, (15 Feb 2001): 860-921.
http://www.nature.com/nature/journal/v409/n6822/pdf/409860a0.pdf. (accessed 16 Nov 2009). Institute of Medicine and National Research Council. Giving Full Measure to Countemeasures. Washington, DC: The National Academy Press, 2004. Institute of Medicine and National Research Council. Globalization, Biosecurity, and The Future of The Life Sciences. Washington, DC: The National Academic Press, 2006. Izumikawa, M. et al. 2005. Auditory hair cell replacement and Hearing improvement by Atoh1 gene therapyin deaf mammals. In Institute of Medicine and National Research Council. Globalization, Biosecurity, and The Future of The Life Sciences. Washington, DC: the National Academies Press, 2006. King IV, William E. Biological Warfare: Are U.S. Armed Forces Ready? VA: Association of the U.S. Army, 1999. Kiziah, Lt Col Rex R. Assessment of the Emerging Biocruise Threat, Counterproliferation Paper No. 6. Maxwell AFB, AL: Air University Press, 2000. Leitenburg, Milton. Assessing the Biological Weapons and Bioterrorism Threat. Carlisle, PA: U.S. Army War College Press, 2005. Mangold, Tom and Jeff Goldberg. Plague Wars: The Terrifying Reality of Biological Warfare. New York: St. Martin’s Press, 1999. National Intelligence Council, Mapping the Global Future, Report of the National Intelligence Council’s Project, NIC-2004-13, December 2004.
http://www.foia.cia.gov/2020/2020.pdf. (Accessed 10 Dec 09). National Intelligence Council. Global Trends 2025: A Transformed World. NIC 2008-003, Nov 2008. http://www.dni.gov/nic/PDF_2025/2025_Global_Trends_Final_Report.pdf. (Accessed 10 Dec 2009). Oliver, Richard W. The Biotech Age: The Business of Biotech and How to Profit from It. New York: Graw Hill, 2003. Petro, James B, Theodore R. Plasse, and Jack A. Mcnulty. Biotechnology: Impact on Biological Warfare and Biodefense, 2003, http://www.medscape.com/viewarticle/462541, (accessed October 14, 2009). Piller, Charles and Keith R. Yamamoto. Gene Wars. New York: Beech Tree Books, 1988. Use Biotechnology Trends in the Future. INSS Occasional Paper 61. USAF Academy, CO: USAF Institute for National Studies, September 2005. Secretary General (1969). Chemical and Bacteriological (Biological) Weapons and the Effects of their Possible Use. In Bioterror and Biowarfare, ed. Malcolm Dando. Oxford: Oneworld, 2006. Schultz , Lt Col Tim. Biopolitik: A Practical Assessment of Future Biowarfare. Maxwell AFB, AL: Air University Press, 2004. The Gene School, Application of Gene Splicing. http://library.thinkquest.org/19037/therapy2.html (Accessed 21 Jan 2010). University of Arizona. General Biology Lesson Plans. http://biology.arizona.edu/sciconn/lessons2/Vuturo/vuturo/mat_list.htm. (Accessed 21 Jan 2010). Yount, Lisa. Biotechnology and Genetic Engineering, 3rd ed. New York: Facts on File, Inc., 2008. Zhang, Y.Z. et al. 2002. Genome Shuffling leads to rapid phenotypic improvement in bacteria. in Institute of Medicine and National Research Council. Globalization, Biosecurity, and The Future of The Life Sciences. Washington, DC: The National Academic Press, 2006. George W. Bush, The National Security Strategy of the United States of America, September 2002, 13. 2 James B. Petro, Theodore R. Plasse, and Jack A. Mcnulty, “Biotechnology: Impact on Biological Warfare and Biodefense,” (2003), 2, http://www.medscape.com/viewarticle/462541 (accessed October 14, 2009). Richard W. Oliver, The Biotech Age: The Business of Biotech and How to Profit from It (New York: McGraw Hill, 2003), 31. Biotechnology, http://www.medterms.com/script/main/art.asp?articlekey=2467 (accessed 16 Nov 2009). 5 Francis S. Collins and others, eds. “The Human Genome Project: Lessons from Large-Scale Biology,” Science Magazine Vol 300 (2003), 286-288, http://www.sciencemag.org (accessed Nov 16, 2009). Institute of Medicine and National Research Council, “Globalization, Biosecurity, and The Future of The Life Sciences” (Washington, DC: The National Academic Press, 2006), 15. President George W. Bush, “Homeland Security Presidential Directive-10: Biodefense for the 21st Century,” http://www.fas.org/irp/offdocs/nspd/hspd-10.html, (accessed 5 December 2009). William E. King IV, Biological Warfare: Are U.S. Armed Forces Ready? (VA: Association of the U.S. Army, 1999), 3. 10 Malcolm Dando, Bioterror and Biowarfare (Oxford: Oneworld, 2006), 65-66. Lt Col Tim Schultz, Biopolitik: A Practical Assessment of Future Biowarfare (Maxwell AFB, AL: Air University Press, 2004), 8. Institute of Medicine and National Research Council, Giving Full Measure to Countemeasures (Washington, DC: The National Academy Press, 2004), 108. Steven M. Block, Living Nightmares: Biological Threats Enabled by Molecular Biology, in The New Terror: Facing The Threat of Biological and Chemical Weapons. Eds. Sidney D. Drell, Abraham D. Sofaer, and George D. Wilson, (Hoover Institution Press: Stanford University, Stanford, CA, 1999), 44. 14 Dando, Bioterror and Biowarfare, 66. British Medical Association, Biotechnology Weapons and Humanity (United Kingdom: Harwood Academic Publishers, 1999), 10. Christian Enemark, Biological Weapons: An Overview of Threats and Responses (Canberra: The Australian National University, 2003), 9. Secretary General (1969) ”Chemical and Bacteriological (Biological) Weapons and the Effects of their Possible Use,” in Bioterror and Biowarfare, ed. Malcolm Dando (Oxford: Oneworld, 2006), 111. Malcolm Dando, Biological Warfare in the 21st Century (London, UK: Brassey’s, 1994), 9. Ray Kurzweil, The Singularity is Near: When Humans Transcend Biology (New York: Penguin Books, 2005), 397. 22 National Intelligence Council, Mapping the Global Future, Report of the National Intelligence Council’s Project, NIC-2004-13, December 2004, 100-101, http://www.foia.cia.gov/2020/2020.pdf, (accessed 10 Dec 09). Michael J. Ainscough, “Next Generation Bioweapons: Genetic Engineering and Biological warfare,” in The Gathering Biological Warfare Storm, eds. Jim A. Davis and Barry R. Schneider (Westport, CT: Praeger Publishers, 2004), 177. Tom Mangold and Jeff Goldberg, Plague Wars: The Terrifying Reality of Biological Warfare (New York: St. Martin’s Press, 1999), 163-164.
 , (15 Feb 2001), 860, http://www.nature.com/nature/journal/v409/n6822/pdf/409860a0.pdf. (accessed 16 Nov 2009). The Gene School, “Application of Gene Splicing,” http://library.thinkquest.org/19037/therapy2.html (Accessed 21 Jan 2010). Institute of Medicine and National Research Council, “Globalization, Biosecurity, and The Future of The Life Sciences” , 146. Y.Z. Zhang, et al. 2002. Genome Shuffling leads to rapid phenotypic improvement in bacteria in Institute of Medicine and National Research Council, “Globalization, Biosecurity, and The Future of The Life Sciences” (Washington, DC: The National Academic Press, 2006), 147. C.M. Fraser and D.R. Dando. 2001. Genomics and future biological weapons: The need for preventive action by the biomedical community. Nature Genetics 29(3): 253-256, in Institute of Medicine and National Research Council: Globalization, Biosecurity, and the Future of the Life Sciences (Washington, DC: the National Academies Press, 2006), 62-63. Dando, Bioterror and Biowarfare, 106. Institute of Medicine and National Research Council, “Globalization, Biosecurity, and The Future of The Life Sciences” , 48. Ibid., 191-192. 38 Block, 60-63. Izumikawa, M. et al. 2005 Auditory hair cell replacement and Hearing improvement by Atoh1 gene therapyin deaf mammals in Institute of Medicine and National Research Council, “Globalization, Biosecurity, and The Future of The Life Sciences”, 192. Institute of Medicine and National Research Council, “Globalization, Biosecurity, and The Future of The Life Sciences”, 192. Lisa Yount, Biotechnology and Genetic Engineering, 3rd ed (New York: Facts on File, Inc., 2008), 49. 42 Dando, Bioterror and Biowarfare, 103. CDC, http://emergency.cdc.gov/agent/agentlist-category.asp, (accessed 24 November 2009). William Cohen Interview, May 1998, in Tom Mangold and Jeff Goldberg, Plague Wars: The Terrifying Reality of Biological Warfare (New York: St. Martin’s Press, 1999), 372. Joel Garreau, Radical Evolution (New York: Broadway Books, 2005), 100. Charles Piller and Keith R. Yamamoto, Gene Wars (New York: Beech Tree Books, 1988), 109. Lt Col Rex R. Kiziah, Assessment of the Emerging Biocruise Threat, Counterproliferation Paper No. 6 (Maxwell AFB, AL: Air University Press, 2000), 15-17. Dando, Bioterror and Biowarfare, 6. Anne L. Clunan, Introduction: Identifying Biological Agents, Characterizing Events, and Attributing Blame in Terrorism, War or Disease, eds. Anne L. Clunan, Peter R. Lavoy, and Susan B. Martin (Stanford, CA: Stanford University Press, 2008), 1. Arms Control Association, The Biological Weapons Convention at a Glance, 2006, http://www.armscontrol.org/print/2472, (accessed 13 Dec 2009). Milton Leitenburg, Assessing the Biological Weapons and Bioterrorism Threat (Carlisle, PA: U.S. Army War College Press, 2005), 71. Arms Control Association, http://www.armscontrol.org/print/2472 63 Dando, Bioterror and Biowarfare, 6-7. Geneva Protocol, the research, production and stockpiling of such weapons was not prohibited by the Protocol. This oversight over corrected by the Biological Weapons Convention (BWC), signed in 1972 and entered into force in 1975, but this treaty has no verification procedures.